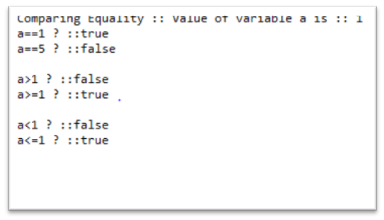 A relational operator compares two values and determines the relationship between those two values. Check if value of variable a is lesser than or equals to 1. Unlike Arithmetic Operators, Relational Operators return Boolean value (either true or false). Relational operators are mostly used while using control blocks in Java. For example – if-else blocks, while loop, do while loop, for loop. The output is shown below or you can click on Try It button. In Java, all the Bitwise operators first convert the input in bits, and then work on them, bit by bit. Explanations of the results in the above table. Bitwise Unary NOT inverts every bit. int has a size of 32 bit in Java. And, that represents -1 in Java. *Note: green boxes represents 1 bit and grey colored boxes represent 0 bit. AND operation returns 1, if the both the bits are 1, else in any case, it returns 0. OR operation returns 1, if any of the bit is 1. Shift left operator shifts every bit of the input to the right. This means, every bit of 10 will be shifted to left by 2 bits and the empty spaces will be replaced by 0. Which is actually 40 in Integer representation. This means, every bit of 10 will be shifted to right by 2 bits. Which is actually 2 in Integer representation. Here the interesting point to note is that, this shift preserves the sign of the input. Thus, as 10 is a positive integer, it preserves the positive sign. Now, let us take an example of a negative number. The bits are shifted to the right, but the empty spaces created in the left side are replaced by 1, to preserve the sign of the input, which is negative. The result is -3 in Integer representation. This difference or >>> operator to >> operator is that: >>> doesn’t preserve the sign of the input. It, replaces the empty places created of the left side while shifting with zeros. Let us, the same example of -10 with operator >>>. So, we have complete our Concepts of Java Operators!